This article is about the coastal town of Puerto Viejo in southeast Costa Rica. 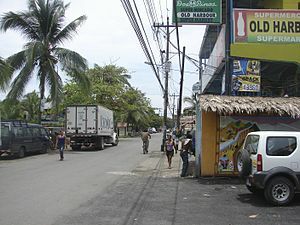 For the town in northeast Costa Rica, see Puerto Viejo de Sarapiquí. Many tourists stop in Puerto Viejo en route to the Panamanian border at Sixaola. This border crossing is popular with people going to and from Bocas del Toro. Puerto Viejo offers the closest accommodations, restaurants, and services to the border. 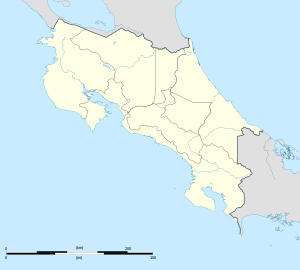 The small border towns of Sixaola and Guabito, Panama are 49 km (30 mi) south of Puerto Viejo. The border towns have no accommodations or restaurants. The townspeople are made up of ticos (native Costa Ricans), a substantial amount of Costa Ricans of Jamaican descent, as well as a number of Europeans who have emigrated to the area. The outskirts of town and the mountains are home to the Bribri Indians. The howler monkey is native to the region. In early April, 2012, nine local businesses and residents were formally notified of the impending evictions and subsequent demolitions of their properties, for being in violation of Costa Rica's Maritime Law. Seventy-six properties (business and residential) have been cited as "in violation" of the Maritime Zoning Laws, with the first phase of demolitions planned for November, 2012. There is a complex history of laws and findings that are being actively reviewed and debated by the affected communities. The Vice President made a show of support for villagers in Manzanillo whose homes were scheduled to be demolished. In March 2014 the Costa Rican legislature approved laws which permitted those residents whose homes were due to be demolished to remain where they were and a law that recognizes the existing coastal towns as well as rectification of the original limitations of the Gandoca/Manzanillo wildlife refuge disaffecting the populated areas. ^ Editor, Editor. "Demolition Orders Issued for Nine Buildings Deemed in Violation of Maritime Zone". Puerto Viejo Satellite. Retrieved 1 April 2012. ^ "Weather for Limon International Airport". Weather Underground.